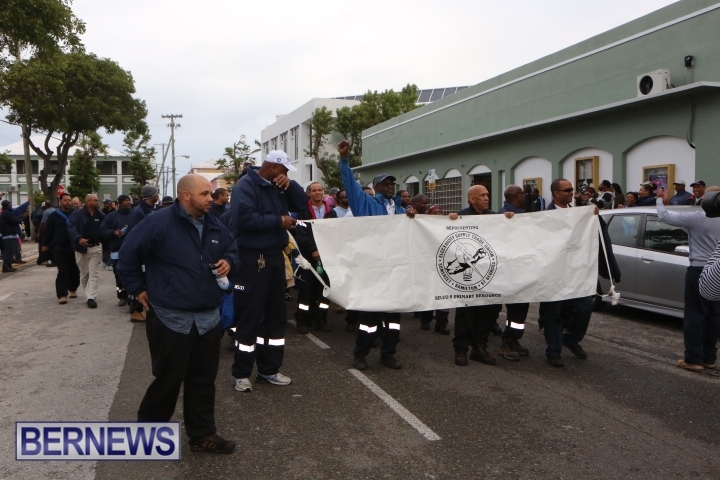 Members of the Electricity Supply Trade Union [ESTU] were asked to join Bermuda Trade Union Congress [BTUC] members “as a sign of solidarity,” and workers have answered the call, arriving at Union Square this morning [Jan 28], as the dispute between the BTUC and Government enters the third day. For our live blog covering the BTUC/Govt dispute click here, and for all our coverage of the matter click here. solidarity!! stay strong bermuda. bermudians must come FIRST in our own country. Yeah, time to march on Alaska Hall and demand that the people who bankrupted the country pay up! yes, all the rich and greedy who don’t support the needy!OBA are supporting the greedy and not the needy….the greedy must learn to do more with less just like the rest of have been sacrificing… STOP GIVING BREAKS TO THE RICH! and to the poor STOP BELIEVING EVERY THING YOU HEAR>> test the ‘spirits” make sure they are true by the deeds they do..
you’re not going to have a COuntry to come first in if you all keep this up. 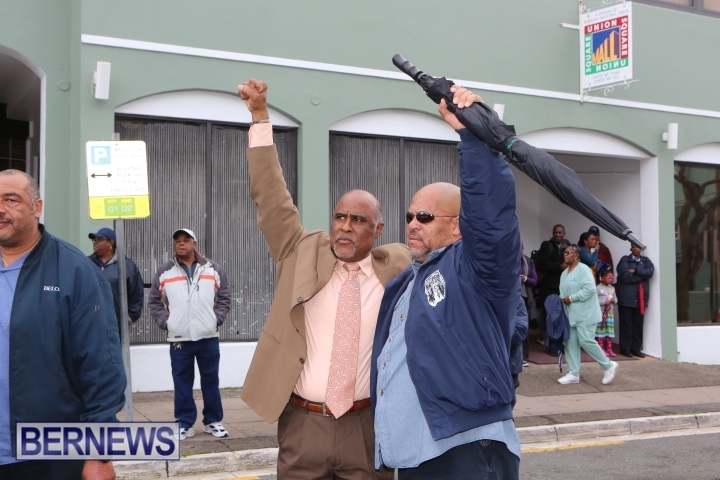 If your thought is that Bermudians must come FIRST then why are Bermudians being stranded & forced to take taxis which they probably cant afford, shouldn’t the education of Bermudian childen come first? What you really mean is union workers first. This is an irrelevant comment for the current action. Are you implying that foreign workers are stealing the furlough days? Or that foreigners have put Bermuda in the position where furlough days are needed? Neither of these are true. The problem was created by Bermudians and now Bermudians must fix it. That is what happens in the real world when there are problems. Very fitting for the 50th Anniversary of the Belco Riots !!!!!!!!!!!!!!!!!!!!!!!!!!!!!!!!!!!!!!!!!!!!!!!!!!!!!!!!!!!!!!!!!!!!!!!!!!!!!!!!!!!!!!!!!!!!!!!!!!!!!!!!!!!!!!!!!!!!!!!!!!!!!! I thought BELCO were a/an Ecential (sp) service. In the mean time….no lights went out and no bulbs were injured. No they are not because they are trying to do something that is against their employee’s rights. You cannot legally impose furlough days on your staff. U have the right to ask them and they have the right to say no. With that being said, BTUC has put government in a position in which furlough days have to be taken out of the budget period. Now the only recourse government has is to find their savings somewhere else, increase taxes on the private sector, or layoff some of their employees. It because a rights issue when you try and force something on your employee when you have no legal right to do so, even if it may help the company get through the current economical climate. No boss in the private sector can force their employee to take a furlough day. And if they did then their would be a legal issue. Government is no different! That is something that has to be agreed upon. 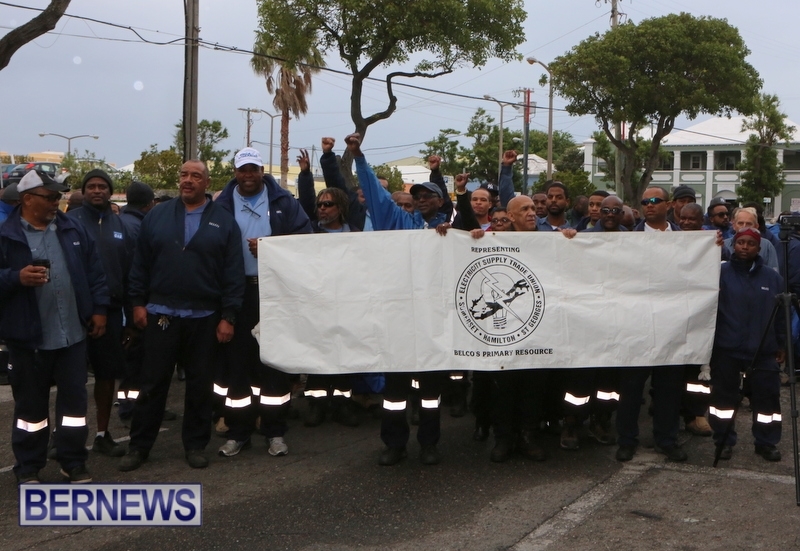 Now BTUC may have to live with the fact that there will be layoffs. That’s life. The Union agreed to the furlough days. The government is saying they will continue them and it is the Union that is saying no….now. You should know this stuff if you attending the meetings. But that’s really funny isn’t it? There were no meetings. You were simply told that your rights were being violated and you were not given a chance to vote. The Union agreed to the furlough days for a certain period of time. Both parties held up their agreement for that specified timeframe. That proposition has now expired. So now it is up for both parties to agree to furlough days. If one position does not agree to the terms within the new proposal then it cannot be put forth. Part of the previous agreement was for furlough days to stop as of a certain date. do you sugget that we worship the likes of the oba? they need to stop making promises they can’t keep and learn to communicate with the Bermudians that put them in a position to make decisions based on OUR needs not needs of entertainmetn like Ac. I think the OBA is listening to the people, that is why Fahy issued Labor Dispute Notice. People are tried of the constant disruptations in service. Union workers are a minority of the population. “The people” would be all of us. effective immediately all churches should pay 40 percent tax on all donations an audited ! SOLUTION – let’s just all pay 10% in income taxes. Then we can pay the budget, the excess in government workers and pay down our deficit. Would you all like this? They need to cut some of these work permit positions withing government , to cut costs first. why is it always gotta be union workers are wrong and not prc’s and others who try to dominate our very existence coz they can’t make it like this in their own country.. they don’t even wanna go back, cause we been so passive allowing them to stay and ignoring what progress they make due to our’nice” ‘giving’ accomodating’ friendly attitudes.. our kindness has been taken for weakness for far too long.. people have constantly taken advantage of our hospitality and they don’t support the people that make it possible to enjoy a life outside of their pown country..ungrateful!!!!! And consultants, especially the 3 that came up with $5 Million on the Govt. negotiation team. Spending (including spending on consultants) has been significantly reduced under the oba. If more consultants can be cut I support it, but it would be a drop in the bucket relative to money we need to find. It wouldn’t change this scenario at all. you mean like giving tourism board an unstated amount in wages to do with whatever they want with millions millions of tax payers money,.. you mean like cuts that would allow us to accomodate filthy rich to come and romp on our shores with a possibility of breaking even or profit.. yeah like that you mean, those kind of cuts? cuts to the elderley, cuts to the pension, cuts to the assistance dept,…. those cuts, cuts that assist the people who already AGREED to limited furlough day memorandum..if someone makes an agreement with you and breaks it, let us know how it ,makes you feel.. especially when it affects ya lifestyle. Maybe we should but that won’t happen. Better yet, we need a capital gains tax. Why should we have to pay the salaries of unnecessary employees? The size of the government compared to the size of the island is an embarrassment. Bermuda needs to implemen income tax country wide for several years. Everyone collecting a pay check should get ducted 5-10% of the annual income until this debt is paid off. Anyone not willing to do this truly does not care about the future of Bermuda. And lets not all forget, this is the mess the PLP got us in. Have You heard of Payroll Tax? I can not stress enough how terrible this idea is. International business is not here for the weather. Bull***! Tax the people who represented and supported the party who sank us into debt for 14 years! The ones who were living large off the public purse despite warnings. They should be taxed to pay the overemployed CS! That will result in a mass exodus of ex-pats. We came here to not pay taxes. If we are paying taxes as well as paying the higher cost of living, we might as well leave. IB will leave as well, then you won’t even have the income you do now. That’s simply not true. Most ex-pats come from places where income tax is the rule – and would have to go back there if income tax were introduced in Bermuda. I’m a Bermudian and live in Canada despite paying income tax. People live where they do for a wide variety of reasons and the tax regime is just one of them. Right now, everyone effectively pays a very high rate of tax in Bermuda in the form of customs duties – the most regressive tax available. Introducing income tax while SIMULTANEOUSLY eliminating customs duties would be the biggest boost ever for the Bermuda economy. For the poor and middle class the cost of living would be lower, while those at the top end would feel a little pinch. There is a reason why income tax is the norm in developed countries – it’s the fairest tax around. Higher cost of living largely inflicted on Bermuda by IB. You didn’t follow the AIG model and remain in the same wage and benefit bracket as the majority of local companies. Nope, not you bunch. You opted to pay way, way over the top and as a result housing / rents and the like increased significantly. And finally, I would much prefer to live in poverty than to constantly listen to you bunch tell me how I must get in line. It’s a tad Southern / circa 1900 and I think we need to change the egenda. Self-imposed furlough days. If they do this for 3 weeks a year it solves the whole problem. This will result in the privatization and cutting of further jobs. Congratulations. One day a month for another year isn’t worth this protesting. Dunlkley…give em their furlough day back and cut the civil service by 15%. END OF STORY!! The furlough days should not be a blanket, across the board kind of thing. There are some departments that are over-staffed leaving the staff with lots of free time and some are short-staffed leaving the staff stressed and overworked. It’s easy to just cut everyone but that’s taking the easy way out. For example, the community clinics have gotten really busy as they are short staff-perhaps that is one department that should not be touched. Then you go to some departments and the staff are on the internet or watching the t.v.’s that are in there. Speaking of t.v.’s, why are they in practically every Gov’t department? Sell them and save some electricity-people don’t need to watch t.v. while they wait for whatever they’re there for! Most of the time, it’s the staff who sit around watching them. There are so many ways to save money. Many Gov’t departments spend a fortune on paper-even printing on both sides of the paper will save money! Someone made a good point in another forum-why does Gov’t spend so much time mailing out those glossy brochures to tell us stuff that many of us already know and that most people just throw away? It’s a waste of money getting them printed and a waste of gas for the postman to deliver. Gov’t regularly post ads in the newspaper telling us things we already know (like the trash pickup days)-cut that out. The politicians need to set an example-they think the rules are for us minions and not them. They travel in style, stay in nice hotels and eat nice meals. Why do we even buy meals for them when they travel-it’s not an extra expense as they would eat whether they were here or overseas. Why not eat some value meals at McDonald’s instead of a gourmet meal? All of that adds up, does it not! Furthermore, we don’t have to attend every event that comes up overseas! We’re told that it benefits Bermuda, that the ministers are ‘networking’ etc. but are they really or is it just an excuse to travel on the public’s dime? Speaking of travel, Bermudians are the most well-traveled people in the world, I’m sure. We all need to do our part to spread the word and get people to travel here. Many already do things like take brochures and the like and give them out overseas but there should be a more concerted effort to do this. Gov’t could print out nice brochures, bumper stickers, buttons and the like and encourage locals to take them and give them out overseas and also give a bunch of bumper stickers to our visitors as well to put on their cars when they get back home. It’s the little things like that that could make a big difference to tourism. It’s time to think outside the box! You are finally going to see what happens when people come together and unite for a cause. I’m happy that my children get to witness history in the making. Thank you BELCO for assisting. So clearly this has nothing to do with furlough days for Government Unionised workers in the first place! Lets call a spade a spade – this is simply about the Union leadership playing a game of brinkmanship with the Government but the irony is guess who gets hurt the most in this the Government workers/general public themselves. How about they accept what alot of people have had to in the private sector. many of us have had to deal with reduced hours, or wages or vacation pay, or all three! I myself have had to, whilst living with 10 days paid vacation and 8 days paid sick leave. I have no sympathy for the protestors Or their ‘plight’. I am much more ashamed that the taxes I pay go towards paying these outrageous benefits. So now that Belco has joined in on this farce, where does that leave my discount for the 14 days without power back in 2014? Have we forgotten that? If BELCO is an essential service, and the ESTU walk out, what are the ramifications? exactly… and they are now in Breach of the collective bargaining agreement.. with Belco.. But King Furbert doesn’t respect the law, or any agreement that he has made!!!! Problem is its all the rest of us who are going to be slammed in the next budget to make up the deficit that’s required to keep the under productive, entitled, job for life Civil Servants paid! lay off the ones who don’t work (about 50%) privatize W&E, job done, seems to me that Government are running a social jobs experiment that keeps the actual unemployment figure artificially low and what civil servant should be paid over 100k a year…really! ^ An attorney in the Attorney General’s Chambers? A chief Engineer at Works and Engineering? Just two examples of civil servants whose professional designations should command over $100k per year. This is now getting bleddy well ridiculous!!!! Children are not in school, ppl that depend on public transportation are suffering, parents are missing time from work because there’s no one to look after their children…like WTF?? Whilst I am in support of what’s right and what’s wrong, everyone involved in this chaos doesn’t seem to know, let alone care the affect it’s hving on ppl that need to get where they hv to go!!! Enough is enough now!!! Y’all need to blow the wind outta ya *** and sort this mess out immediately!!! #TiredOfBullS—!!!! Hold on Bob. Two more days and you would have saved a good chunk. The teachers are the worst of the lot. All the schools are closed so it’s easy to identify that saving. BIU and BPSU staff will go to work, clock in and leave. Difficult to prove that they didn’t come to work. guess who will argue their case better? Let’s make something clear. A fact which also shows your lack of knowledge on the subject. The schools are closed because the ministry closed them. Not because the teachers were not there. They did nothing to see if we would make other arrangements. The decision was in the ministry’s hands! Meaning you’re current premier and his cabinet. So I would be careful when you cal them the worst of the lot. Especially when that sentence is grammatically incorrect. Shows that your ignorance expands to more than your knowledge of the situation. Stay strong government. You can outlast them. They are not getting paid and soon you can fire 1/3 of the civil service. That will relieve the budget problems. This has the makings of something quite untidy. Bermuda is extremely divided down racial and socio- economic lines and these blogs highlight it daily. I am confused. This issue is about furlough days, but comparisons to 1965, for example “decision that had to be faced back in 1965″, and a call for workers to stand up for their rights seem odd to me. This issue is not about taking away rights or fighting for civil rights, it is about a cash strapped, in debt government, who desperately needs to cut spending. So why the comparisons to 1965 and the fight for civil rights? These comparisons seem odd to me. Also, there are calls for ‘shared sacrifice’. So far, the major sacrifices have fallen on the private sector. Government as not layed off anyone, all the layoffs have come from the private sector. Government is supported by the private sector, so essentially the private sector is being asked to sacrifice more to keep the current Government structure afloat. This does not appear to be ‘shared sacrifice’. This is nothing but POLITICAL.. Th PLP are sitting back pointing fingers and NOT doing what we all pay them for and wouldn’t know what to do anyway.. They are part of the Government and therefore part of the solution!!! you plp/union lot need to take the blinders off, and ear plugs out to hear and see the real world. love the pic of your leader with the clenched fist raised above his head. And you tell me this is not politically motivated. BS! Closed minded lot like a bunch of Lemmings. I guess there is not a cash problem in their eyes. Thanks PLP for getting us here on both counts. Brother Chris is still collecting his pay check from your contributions. Maybe the private sector should band together and protest the actions of the unions. The civil service does not represent all Bermudians, not even close, and who exactly do you think pays your salaries? It’s not the Premier or his Cabinet, it’s the private sector – who right about now are getting very fed up with your selfish and misguided actions. The Island is broke. There is no money to pay you all. When that happens in the private sector, people accept pay or hours cuts, keep their heads down, work harder, or learn a new skill to keep themselves useful and relevant and from being laid off. They might grumble, but they accept that these cuts are to keep the company from going under and to prevent ALL employees from losing their job as a result. Our Island is sinking. The civil service is unsustainable. Your options are furlough days or redundancies. Neither is pretty. Neither is nice. I feel for you and your families, but the stark reality is that the money is gone, our debt is unsustainable and those are your options. You might see your actions as standing up for your rights, but all you are doing is risking the right to a decent future for all Bermudians, yourselves included. International business provides something like 90% of our foreign income and Tourism much of the remainder. These industries fund your salaries and many of the salaries in the private sector. International business wants to locate in stable political environments and tourists want to visit somewhere where they can at least catch a bus! What you are doing could be devastating to both Tourism and International Business. Stop biting off the hand that feeds you and everyone else on our beautiful island and get back to work! 1. Give back furlough days. 2. Parents of Students in Public Schools pay $1,000.00 per year per student. This would have two benefits. a. Defray the cost of running the school b. Make parents more concerned that there children are going to school and are getting good grades. 3. Raise the cost of public transportation by 100%. This will cover all the furlough days for bus drivers, and ferry drivers, sick and vacation days. 4. Increase licensing of cars 100% on largest car, decreasing percentage down for lower class cars. 5. Introduce co-pay for hospital visits by 100%. Maybe this will decrease the cost of health care, and people would not be going to the hospital because of a cold or common headache. 6. Increase Land Tax, Highest rental value gets the highest percentage increase. Decreasing as you get lower. 7. Make sure that Government vehicles are parked in Government yards when not on official business. Every department. Baby seat in back of W&E SUV comes to mind. 10. Let everyone take there trash directly to Tynes Bay on a designated day of the week. Imagine the cost savings on overtime alone. 11. Setup more radar traps on North Shore anytime of day. Easily accomplish two things. a. Safer Roads b. Thousands a day in fines. 12. Build a bigger holding area at Hamilton Police Station. Then Set up breathalyzer every night on East Broadway. Instant $1,000.00 fine for driving impaired. Easy money. 13. Increase customs duty at Airport to 50%. No allowance. With some of the extra money, hire more customs officers to check everyone’s declaration is correct. Might need a bigger airport! 14. Check that people on Social Assistance actually should be on Social Assistance. Maybe this is done already. Not sure. Run each department in Government like a business. If W&E are making a loss, then the headcount and revenue generating should balance. If it doesn’t, people must go or taxes must rise. That’s how it works in private sector. Hence why no unemployment in public sector = broke. High Unemployment in Private Sector = break even if not worse. I also think I will investigate a way to serve a CIVIL LAW SUIT on behalf of the people of Bermuda against the BTUC, unions and some other political persons of the non ruling party for pain,suffering, taxi fares,possible lost wages etc etc. mainly for being so deaf and blind to US the people of Bermuda. Also boycott any Tweed church, and any union sponsored activities, events, or places of contact that includes the gas station or some of the political Flip Flops. i have endured pain and suffering thanks to you lot actions past, present and apparently future. Shows that you don’t give a rats ??? about your island unless suits your ambitions. The cost savings are there. Govt just prefers the easy way out to continue furloughs beyond an agreed upon contract end date because the process is already in place via payroll systems etc. While at the same time they are not willing to cut the many suggested areas of obvious wastage taking place year after year after year after year as suggested by senior management. The Premier called some suggestions offered last night small stuff and immaterial. Small stuff adds up to big stuff. It is they who do not want to listen. Areas of cost savings include: Consultants. Concessions. Work permit holders. Utilities. Overtime (very excessive). More freezes. Early retirements. Rents paid to private companies. Timely chasing of debt owed to Govt. Together these are just some of the things that can result in the equivalent and more to the savings achieved via the furloughs. Plus there is the extra $77 million needed for the AC35. Where is that money coming from? What happened to the $800 million extra borrowed that was supposed to last for 3 years? That’s what this protest is all about. Govt has not changed its spending stance significantly enough and prefers to ride the backs of the entire civil service some more who are facing a 19% increase in GEHI this coming April 1st and next year April 1st. 38% in total to be paid for from the wage freeze since 2010 despite cost of living increases, rents, food, etc during that time. The civil service have had their turn of sacrifices since 2010. They’ve already given $36 million plus the pension freeze a few years ago. And still the spending in those areas mentioned above have not gone done significantly. Enough is enough. And what about the $800 million missing during the PLP reign. Thus the shortfalls et al. Wake up folks and get over this entitlement crap. Were down to one oar.